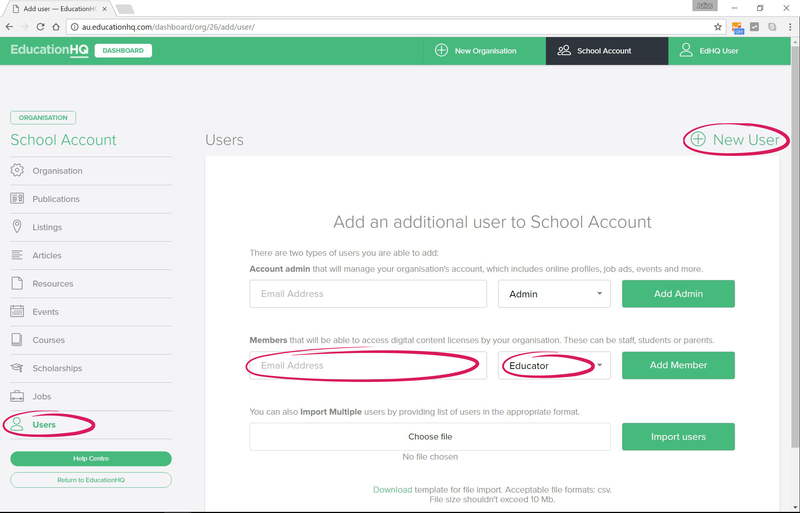 This guide will assist you in adding all users types to your EducationHQ organisation account. 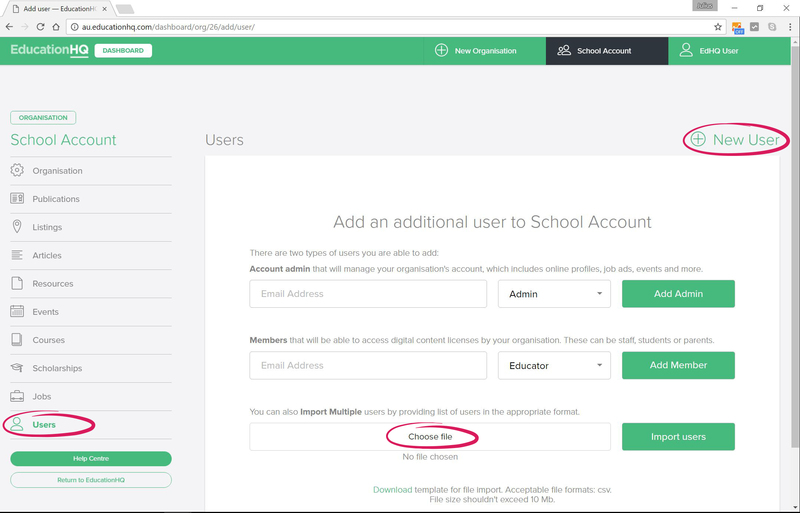 Adding admin users provides other staff members access to your organisation account. This allows them to manage your online school profile, events, jobs and user management. 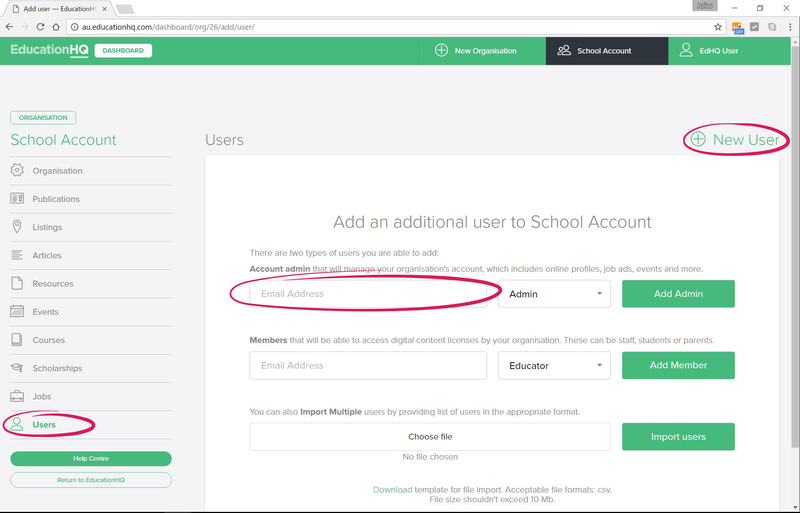 In the Account admin section, highlighted below, insert the email address of the user you would like to add. Click the ‘Add Admin’ button. The new user will receive an email inviting them to your organisation’s account. Once they login, they have the same permissions that you are currently using. Digital subscription access can be granted to educators, students and parents within your school community. This provides members with access to all EducationHQ publications relevant to principals, teachers, students and parents. New users can be added individually for small additions, alternatively larger amounts can be imported using a file import facility. Each time we release a new publication that is part of your digital licence, members will receive an alert from EducationHQ. Members will receive notifications when a new publication relevant to them is published. Adding digital licence members provides users access to digital content licenced to your school or organisation. In the Member section, highlighted below, insert the email address of the user you would like to add. Please select the correct role ie whether the user is an educator, student, parent or other. Click the ‘Add Member’ button. The new user will receive an email inviting them to your organisation’s account. Once they login, they have access to digital content from within their account by clicking on the ‘Publications’ menu item. Bulk addition allows you to add multiple users at once to save time. To do this you will need to prepare a file for import. The file needs to be in CSV format and no larger than 10mb. In the Import Multiple section, highlighted below, click on ‘Choose file’ and select the file you have prepared. Click the ‘Import users’ button. Please note: our server will save your file and then take time to import your users. You will be able to see all users added by clicking on the ‘Users’ menu item on the left menu column.